( included is a list of various parts with prices attached ) need to be adjusted, but it is a very nice overview. Over 18 years, Fiat--and then, later Pininfarina--sold somewhere around 120,000 124 Spiders in the United States, the lion's share of cars the manufacturer ever built. It's a testament to the Pininfarina-designed car that it still looks as fresh and sporty today as it did when it was introduced in 1966. But for one reason or another, whenever Americans ready themselves to purchase a sports roadster, the Fiat 124 Spider falls to the bottom of the list. Some claim it's due to the bad reputation Fiat had in the 1970s for turning out pretty cars that ran every third Tuesday. Others blame demon rust, which seems to have a particularly ravenous appetite for Italian machines. Or maybe it's the fact that there were so darned many of them that they've fallen off the radar of many sports car fans here. Whatever the reason, it's time to rethink our attitude toward the 124 Spider. These cars have been on the road long enough to dispel any urban myths about their longevity and original build quality, and there are plenty of parts suppliers, experts and club advisors around to sort through any common problems these cars have had over the years. According to Dwight Varnes, a past vice-president and co-founder of Fiat-Lancia Unlimited (FLU), and the co-founder of that group's Fiat Freak Out annual meet (July 14-16, 2006), the biggest problem with a Fiat 124 Spider was often not the manufacturer, but the dealer. "An awful lot of dealers took on the Fiat franchises as a second or third line," he says. "Lots of the dealers specialized in American cars, and they took on Fiat as a cheap import. The service departments just didn't want to understand them." With the exception of the Triumph Spitfire and the MG Midget, Fiat 124 Spiders represent the cheapest point of entry of any sporting roadster on the market, are available in almost every local want ad, and even offer a vestige of a back seat for the family oriented, provided your kids have stumpy little legs. And if spirited driving is your interest, you'd be hard-pressed to find a car with as nimble handling at this price point. It's easy to miss one of the Spider's most appealing attributes: its size. It offers interior accommodations significantly larger than most competitive roadsters from its day. Sit with a passenger in an MGB and, unless you're a person of small stature, you'll be touching shoulders most of the time. Do the same in a Fiat 124 Spider, and you'll be surprised to note that there are several inches between you, and that you haven't extended the seats all the way to the limit of the tracks. The 124 was born from Fiat's most versatile platform. From its roots came a coupe, a convertible, a sedan; it even lived on in perpetuity as the Russian Lada. The Spider and the coupe were both derived from the sedan, which was introduced in 1963. 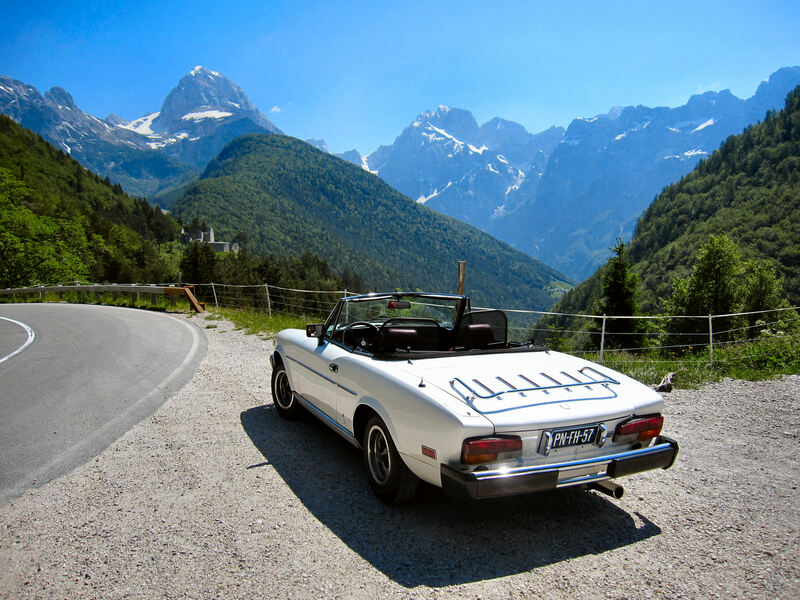 The 124 Spider was first introduced at the Turin Auto Show in 1966, after which it went on sale as a 1967 model. The 124AS began in 1966 and ended in 1969, and featured a 1,438cc four-cylinder. 1967 "AS" Spiders are very rare and feature unique equipment not commonly found on Spiders sold in the United States. Most notably, the heater controls were mounted on the dash and used horizontal slide controls. When the car reached U.S. shores in 1968, heater controls moved to the console, where they would stay for the life of the car. Early AS cars were equipped with a driveshaft mounted inside a "torque tube," but the design was dropped in 1968 in favor of the more common rear axle with trailing arms, apparently because the torque tube rear-axle housings were developing cracks. According to Dwight Varnes, a long-time Fiat 124 Spider owner, "The AS cars had innumerable unique pieces compared to those that followed (smaller taillamps, for example), and this makes restoring the AS much more difficult." BS Spiders--sold between 1970 and 1973--still used the 1,438cc engine, but were revised to include the design cues of the later 1,608cc cars, such as the taillamps, the black gauge bezels and the mesh grille. Look for two-piece lenses on the side marker lamps to identify 1970 models. All others had a one-piece lens. BS Spiders gained a second carburetor for 1970; 1,608cc engines began filtering into production in 1971. These engines were from the same family as the 1,438cc engine used in all 124s. For the most part, external changes were limited to a "1600" badge on the rear valance. In 1973, the last of the BS cars, the 124 Spider, got yet another engine, from a completely new family. The 1,538cc engine was derived from the 132 sedan, which was never sold in the U.S.
From 1974 to 1978, Fiat produced the 124CS1 with the numerically optimistic "1800" 1,756cc four. To compete with tighter emission-control regulations, the 1,756cc four had an air pump driven off of the exhaust cam. 1974 CS1s are the end of what 124 fans describe as "small bumper cars." Most U.S. versions of the car had thin chrome and rubber bumper overriders, which weren't as offensive as the ones on many cars of the era. Cars destined for both California and Maryland had much larger rubber blocks in place of the overriders on all other U.S. cars. 1975 CS1s are immediately recognizable by the much larger--and much maligned--"twin tube" bumpers that were designed to comply with 5-mph bumper regulations. License plate lights on these cars moved to the rear valance panel from the rear bumper, and the grille emblem moved up to the hood. Like other years when a significant change was impending, some 1978 Spiders were fitted with parts destined for the later CS2 Spider which started in 1979. Don't be surprised to find a 1978 124 Spider with 1979 door handles or even a rear differential. These are commonly referred to as "1978.5" models. If a CS1 hood was damaged and needed to be replaced at some point after manufacture, it may have been replaced with a later CS2 hood, because that's all that was available from the factory. The "124" designation was dropped in favor of the "Spider 2000" name in 1979. The biggest change was the 1,995cc engine from which the car got its name, but myriad other changes were taking place. Outside, the hood features larger twin-cam bulges, taillamps and door handles, while inside, new seat materials were offered (including leather). Alloy wheels, which had not been an option since 1974, were made optional once again. The smog pump finally disappeared in favor of a catalytic converter. In 1980, Spiders were fitted with Bosch L-Jetronic fuel injection, which was a vast improvement from the early CS2's poor carburetor and intake manifold design. In 1982, Pininfarina took over where Fiat left off, marketing a Spider Azzura under its own name. The 1985.5 model was the last hurrah for the 124 Spider model with the addition of larger front brakes, and rack and pinion steering. Pininfarina discontinued producing the Spider in late 1985 to retool the factory to produce the new Pininfarina-designed Cadillac Allante. What's the best year to look for? A tricky question, because it's mostly based on preference and budget. According to Dwight Varnes, one of the most appealing offerings is the 1981 to 1982 fuel-injected 2000 Spider. "They were as close as the Fiat 124 ever came to a 'secretary's car,' but they offered a lot of nice equipment and much better performance," he says. For those looking for a more vintage car with less obtrusive bumpers, the 1971 to 1972 cars have the looks, plus the best performance of any of the carbureted cars. Unfortunately for the budget-minded, the 1979 to mid-1980 cars are the least expensive, but also the most clogged with emissions plumbing, which strangled performance. Jon Logan of Midwest 124 notes that the 1979 49-state version has a more desirable 4-2-1 exhaust manifold versus the 1979 California version and all the 1980 carbureted models. "The carbed 2.0-liter cars are the worst performers in stock form but are very easy to modify by using the 1975 to 1978 models' intake and carburetor," he says. But, as 1979 was the largest production-run year, they also tend to be more commonly available. Fiat drivelines are relatively durable and inexpensive to replace if something does go wrong. Used transmissions are available, but Dwight Varnes recommends rebuilding your existing transmission. "It's usually best to have the existing box rebuilt, which usually only needs synchros, shift forks and bearings," he says. Chris Obert, proprietor of C. Obert & Co., recommends changing rear differential fluid every 25,000 miles or two years. A leaking pinion seal--something that can seem simple enough to fix--can turn into a real problem if you're not careful. Obert recommends, "While home repair in a well-equipped garage armed with a shop manual is possible, it's a lot more complicated than most Fiat owners realize." Dwight Varnes provides "Dwight's Rule": It's a bad ground. "90 percent of a Fiat's electrical problems can be directly traced to a dirty or corroded ground. Component failure is actually pretty rare," says Varnes. The challenge, of course, is tracking down those bad grounds to alleviate the problem. Start with anything that's been added to the stock electrical system over the years: Radios, foglamps, driving lamps, relays, etc., especially those connected with unsoldered crimp-style connectors, can cause electrical nightmares. Once you've eliminated any potential problems here, begin with a wiring diagram and trace every single ground to find out if it's dirty or corroded. Chances are almost guaranteed that you'll find your problem here. Popular opinion has blamed high oxide content for Fiat rust. But even more importantly, anything the customer didn't see was never protected by paint. Rust in the floors, quarter panels and rockers is bad, but not a deal-breaker, especially if you do some work yourself and can buy the car for cheap money. However, perforation anywhere around the steering box mount is a walk-away problem. Front shock towers can be repaired, but, according to Dwight Varnes, probably not by the average shade-tree mechanic looking for a fun project to work on. Rust where the rear trailing arms meet the body is repairable, but by the time they're shot, the rest of the car will be so bad, you won't want to bother. The Spider's suspension is the key to enjoying the car, but it can also be a serious weak point if not cared for properly. Any one bad component here can amplify a suspension problem in your Spider, and aftermarket part quality varies greatly. "We've experienced numerous problems with off-brand ball joints that have disastrously failed. I recommend buying from only Fiat-specific vendors for best quality," says Varnes. Be sure to look over the 124 Spider's front crossmember, which the lower control arms mount to. In extreme cases, the mounting points on the lower control arms can crack, causing them to separate from the crossmember. Be sure that the bolts that secure the crossmember to the unibody structure haven't been loose, since they can tear out of the unibody structure's sheetmetal. Torque the control arm nuts to specification. Danny O'Donnell is the proprietor of Fun Imported Auto and Toys (Get it? F.I.A.T?). He's owned more than 200 Fiats over his lifetime and knows as much about these cars as anybody. "I can assemble a complete car with the parts I've got laying around," he says. So what's the deal with Fiat's poor reputation for quality? "In 1977, production was quite high," says O'Donnell. "They were shipping cars to America on the outside decks of ships. They'd get exposed to salt air and seawater on the trip. The problem only got worse because the dealers wouldn't wash the undercarriages and let them dry. Instead, they undercoated right over the salt, and the results were disastrous." O'Donnell notes that his 124 Spider has period aftermarket BWA alloy wheels, and that the radio was installed at the dealer, as it was in all cases of the 124 Spider. The dash is otherwise in decent condition, except for a cloudy clock lens. "Unlike the rest of the gauge lenses, the clock lens is plastic and it gets cloudy in the sun," he says. This article originally appeared in the August, 2006 issue of Hemmings Sports & Exotic Car.